Do you ever open the fridge and just randomly put ingredients together? 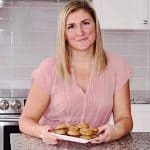 Sometimes these unplanned recipes result in the most amazing, flavourful dishes! That is exactly how this delicious cranberry broccoli salad with cranberry lemon dressing came to be. Before this, I would never have thought to combine these ingredients. But wow, this combo is fantastic! 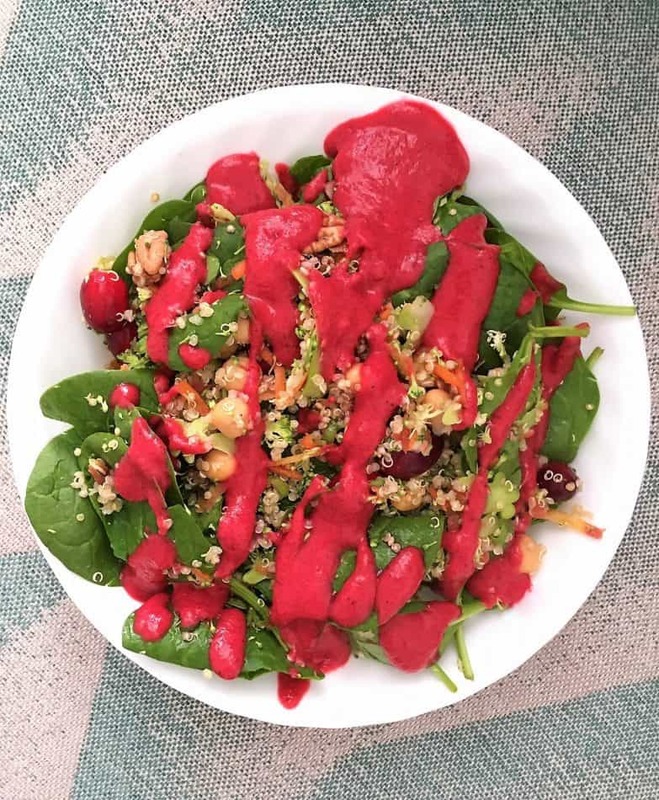 The cranberry lemon dressing is made using simple, healthy ingredients and its the perfect compliment to this salad. This cranberry broccoli salad is crunchy, tangy, hearty, and so fresh tasting. 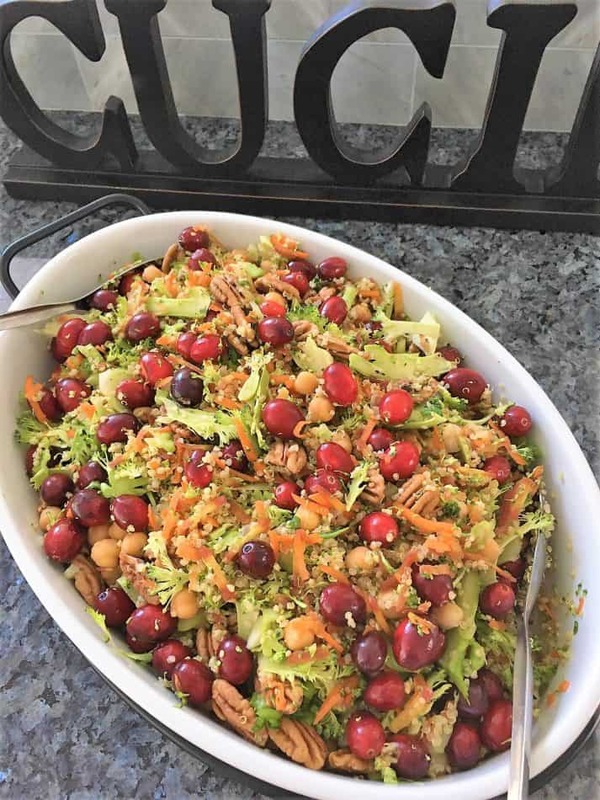 A great salad to compliment your upcoming summer barbecue’s and pool parties! Plus the dressing is so bright, colourful, and wonderfully inviting. It’s creamy, velvety, and the perfect blend of sweet and tangy. My favourite part about this homemade salad dressing? Well, the fact that it’s homemade! That means, no added preservatives, fillers and empty calories. But most importantly, none of the unpronounceable ingredients that often accompany store bought salad dressings. The store bought dressings always seem to contain unnecessary ingredients. And a lot of them! No thanks! With simple dressing recipes like this, there’s no reason not to make them yourself. If you enjoy this salad, you may want to give some of these ones a try! 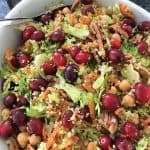 Cranberry broccoli salad is crunchy, sweet, tangy and delicious! Covered in homemade cran lemon dressing for the perfect combination! Add all your salad ingredients to a serving dish and combine. Add all your dressing ingredients to a small blender and process until smooth and creamy. Serve with your salad. Looks so delicious and healthy! Perfect for a balanced dinner or a light lunch. Thanks Kim! Hope everyone enjoys. This salad and the dressing sound so amazing together! a great dish to bring for Easter :). Thanks for sharing! I loved it! Packed full of flavors! Thanks for the feedback Toni! What a great idea! Cranberry, lemon and broccoli 😋 — I love the combination and I’m going grocery shopping today so I’ll be buying what I need to make this tonight! Thanks Charlotte! Hope you enjoy!